impacts for affected people are not mainly caused – or could not mainly be minimized – individually by themselves (such as tobacco use) but by other human beings or larger human activities. The challenges are differentiated according to the kind of possible action or measures for tackling them. Therefore, some similar issues are combined (e. g. [for instance] epidemics), while others are not (e. g., indoor and outdoor air quality may be similar problems, but require very different measures). Additionally, data availability has a great influence on the differentiation of challenges, too, because most available data is aggregated to specific issues. Unfortunately, to none of the quantities data for all the challenges described is available. Therefore there is no common single measurement for all challenges, especially not for those of inherent high risks or increasing damages. However, for most of the challenges, data on several quantities is available, hence the challenges are linked by several measurements of comparison. future economic losses at risk. These indicators are shown in small diagrams below the headline of each challenge. This way we can make all quantities comparable by ranging from 0% to 100%. Now the percentages are simply added for each challenge. Hence, the higher the percentages of death cases, affected people, economic losses etc. (and so on) in comparison to other challenges are, the higher is the resulting total value – indicating the relevance. 1 By deliberate intent, the numbers of current death cases and of future death cases at risk are considered as the most severe and important indicators and therefore weighed double. 3 The numbers of affected natural foundations are already given in percentages (portion of global resources, e. g. 33% of global agricultural land). Since there is unfortunately only very little data available, its influence should be kept minimized. This is done by not upscaling it to a maximum of 100%. The simplified method described above delivers similar results as other methods, that are statistically more sophisticated, but less transparent. If you want to check the combined indicator of a challenge in the survey, just take the data shown in the small diagrams below the headline of the challenge, and the highest values of the same indicators. Then use these values in the calculation described in the overview above (calculate the percentages accordingly and add them). The same way allows you to compare the aggregated values of two or more challenges. Despite all methodological considerations, it has to be strongly emphasized that due to lack of data, as described, and because the quality of available data usually is not very good, the resulting order of challenges cannot be very precise. The challenges fit together into groups with high, middle and lower relevance. 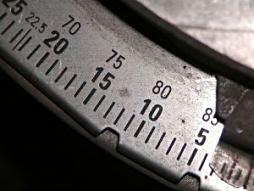 The scale can only be blurred. Therefore, the order is not a matter of rank 5 or 6, but more a matter of rank 5 or 10. Because of these reasons, inter alia, we do not use numbers for ranking the challenges. Nevertheless, the real data shows very clear differences between the challenges indicating higher or lower relevance. This is visualized by the small diagrams below each challenge title. Trend data is quite rare and mostly refers, like targets usually do, to the number or the proportion of affected people (resp. to the proportion of affected natural foundations of life). The trend symbols +, 0 and − in the survey always refer to the latest development in the available trend data (while + means that progress in reaching a target or improving the situation is made, which usually is not identical to an increase in quantity). 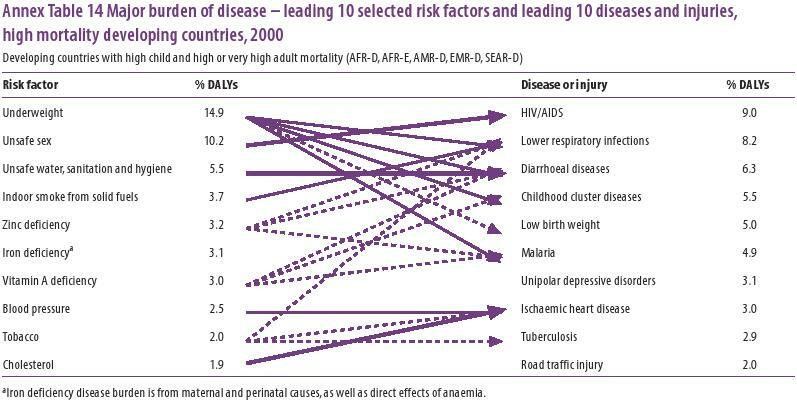 Graph: World Health Organization: The World Health Report 2002 – Reducing Risks, Promoting Healthy Life. , p. 232.